Dyett & Bhatia led a comprehensive update of the General Plan and Local Coastal Program, which are more than 30 years old, to frame a sustainable land use, housing, and transportation vision for this coastal Bay Area community. The Draft General Plan, LCP, and EIR have been released for public review and adoption hearings were in the fall of 2014, and the final plan was adopted at the end of 2014. Plan policies developed through extensive outreach and technical analysis sought to leverage coastal and open space assets for a visitor-based economic development strategy, provide opportunities for mixed-use redevelopment, biological resource protection, adaptation to sea level rise, and the future use of a former quarry site. 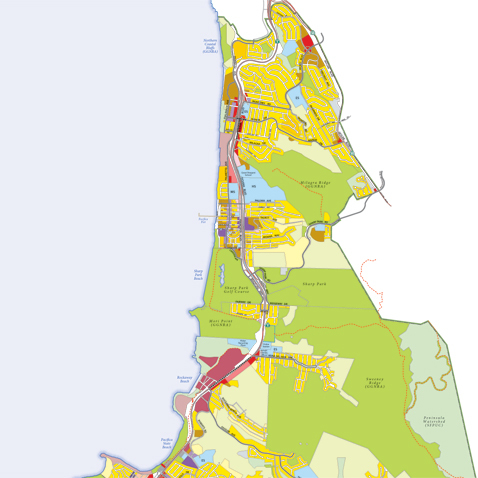 The General Plan and Local Coastal Land Use Plan were crafted as two separate documents organized to respond to their different needs and audiences, but sharing most policies.